Lucky the Pig Gives Lucky Blessings! Look at this auspicious creature! 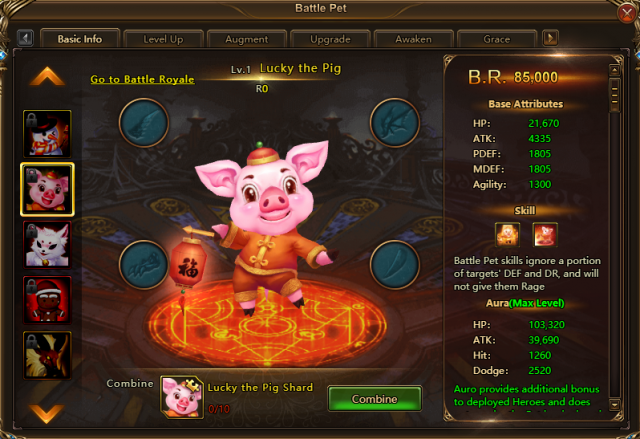 It's League of Angles II's new Battle Pet-Lucky the Pig. It can not only assist warriors in battle, but also give lucky blessings to its master. Lucky the Pig will show up in upcoming Single Server Resource Tycoon event from Jan. 28th to Jan. 31st. Seize the chance to get it! Let’s see how helpful it is! Deal (383%+14300) DMG to enemies in the back row, and reduce their DEF by 25% and healing received by 40% for 1round (this effect ignores immunities). Restore (152%+5670) HP to the entire squad and increase everyone's ATK and DMG by 10% for 1 round. Take Lucky the Pig into your squad and it will show you how powerful it can be! Participate in the Single-Server Resource Tycoon from Jan. 28th to Jan. 31st. Accumulate specific Tycoon points and it will be yours! Stay tuned for more great news and events! Last：Valentine's Day: Special Mount and Clothing for You!